The Internet of Things is Coming—Are You Ready? The world today is seemly awash with data. Yet today’s data flow is a trickle compared the flood that is coming in the next five years. The key driver of this data will be a new wave of inexpensive Internet-connected sensors embedded in everything from traffic lights to water treatment plants. This wave of sensors embedded in everyday items is known as the Internet of Things (IoT). Urban centers are already experimenting with IoT, yet this trend can easily be applied to more rural areas as well. The key limiter will not be the cost of the technology, but rather having a staff that is trained on, and comfortable with, sifting through the mountain of IoT-generated data to reveal insights that will improve governmental efficiency and ultimately benefit the public. Internet-connected devices, including thermostats and light bulbs, are becoming more common in homes across the United States. Cities have started experimenting with similar devices at a much larger scale. 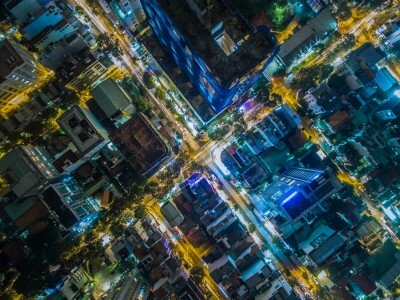 For example, a June 2018 article by Dan Fagan in StateTech Magazine listed Las Vegas, Chicago, and Grand Rapids, Michigan as all experimenting with smart street lights embedded with sensors that can measure air quality, traffic flows, gunshot detection, as well as support cameras, speakers and Wi-Fi hotspots. A commonly overlooked possibility for IoT is the local water treatment plant. Most water treatment systems involve humans testing water samples throughout the day to check for various levels of chemicals. If the plant technician detects an anomaly, the technician can take corrective measures. However, the possibility of human error in this process is significant. In 2017, WRAL News reported that human error caused the Orange Water and Sewer Authority (OWASA) in North Carolina, “To shut down the Jones Ferry Road Water Treatment Plant on February 2 because of fluoride levels in the water were almost 50 percent above allowed levels. A report by an outside consultant said a plant operator accidentally hit a button that caused excess fluoride to be pumped into the system, and the error wasn’t corrected for more than three hours.” This error, combined with a water main break, caused local schools and businesses to shut down for several days. IoT can help prevent this and similar accidents in the future. In a September 2018 blog post for Geospatial World, Kelly Potter noted that, “IoT in water treatment uses the concept of smart sensors installed at various points in the water system. These sensors collect data and send it back to the monitoring systems. This data could include water quality, temperature changes, pressure changes, water leak detection, and chemical leakage detection.” IoT sensors could be embedded at the water treatment plant and at water mains across a city to provide engineers real-time updates on water quality, demand and potential trouble spots like leaks from a failing water main. Giving engineers real-time information would allow the engineers to more proactively plan for repairs and updates, such as shutting down and replacing an aging water main before it completely fails, instead of reacting and scrambling to do emergency repairs. Unlike past computing upgrades, the limiting factor for transitioning to an IoT-based government will not be the technology itself. The number and type of sensors are growing rapidly, and costs per sensor continue to fall. Thus, wealthy and non-wealthy locations, both urban and rural, should be able to easily acquire the technology itself. Instead, the true limiting factor will be training. The governments that invest in their employees and train them to be able to interpret the massive data flows and pull out actionable information will be the governments that truly thrive. Just hooking up the sensors is not enough. Luckily, the tools that employees will use to analyze the data IoT sensors generate are also becoming more user friendly. An April 2019 article by John Murawski in the Wall Street Journal notes that standardized AI [artificial intelligence] templates with easy-to-use interfaces are helping to empower citizen data scientists to more effectively use Big Data and AI to generate insights. Murawski defines citizen data scientists as, “Professionals who have developed competence in AI using automated tools but who aren’t trained specialists in statistics or analytics.” Murawski is careful to note that some training is still required; a local government employee is not going to just magically know how to use the standardized AI templates. However, Murawski notes that the training can be done within weeks, and testing and validation of the AI models can be done within a few months (depending on the complexity of the data and systems being looked at). The next five years will see an explosion of sophisticated yet inexpensive sensors that can be embedded in seemingly every device or piece of infrastructure. Local governments should prepare now to strategically invest in this growing field, both in the technology itself and in their employees. As with any new project, start small, generate quick wins and scale up in a way that makes sense in your environment. The most important thing, however, is to get started now. The IoT revolution is coming. My opinions are my own and do not represent the University of North Carolina at Chapel Hill.